Why does someone share or retweet something your company has posted on social media? As much as you want their shares and interactions to be because you are an amazing brand (which you may well be), they’re not. No one wants to be used as a marketing tool. However, they will allow your branding on a post that allows them to express themselves to their friends. Your aim, as a brand on social media, is not to market yourself; it is to connect. To connect, you need to know what your followers are passionate about. They may or may not be passionate about your brand of juicy beverage, for example, but they are passionate about how healthy, vibrant, sunshiny, popular your depiction of it makes them look or feel. Make your posts about health, vibrancy, sunshine, popularity, not about berries mixed with water. Yes, I know that you want to talk about your brand, and you should. But only 20% of the time. 80% of your posts should evoke feeling. They should be interactional, not transactional. That means that you want people to share, comment, post their own photos, like your posts. You want to interact with them and they with you socially as a brand. Help them feel good about following you. Help them feel good about wanting their friends to follow you too. The other 20% of your posts can be transactional, where you are asking them for a specific action – buy, read, follow, donate, volunteer, act. If they love the 80%, they might act on the 20% even as a sort of thank you for providing them with posts that validate who they see themselves as. You are a for-profit company looking to expand your social presence? Time to do your homework. Who is your customer, beyond their age, income and chances of buying your product? Do people who like your product also love cats? Are they politically active? Are they hikers, knitters, chefs? Give them posts that let them brag about themselves through you. If you connect and entice them to share your items or post photos on your page, you’re not just touching that one person with your message, but you are also reaching all their like-minded friends as well. Trust me that, if they become curious about your products after seeing and sharing that adorable dancing wolverine meme, they know how to go to your website to learn more. You are a non-profit looking to expand your presence? You’re a lucky organization! You actually have it much easier than companies with a “product” because most non-profits were sparked by, and continue to operate through, passion. Most of your volunteers and your team live that passion every day and are also your target followers. They can easily inform your decisions about what will appeal to people. Your challenge is to branch out and find the edges of those passions. 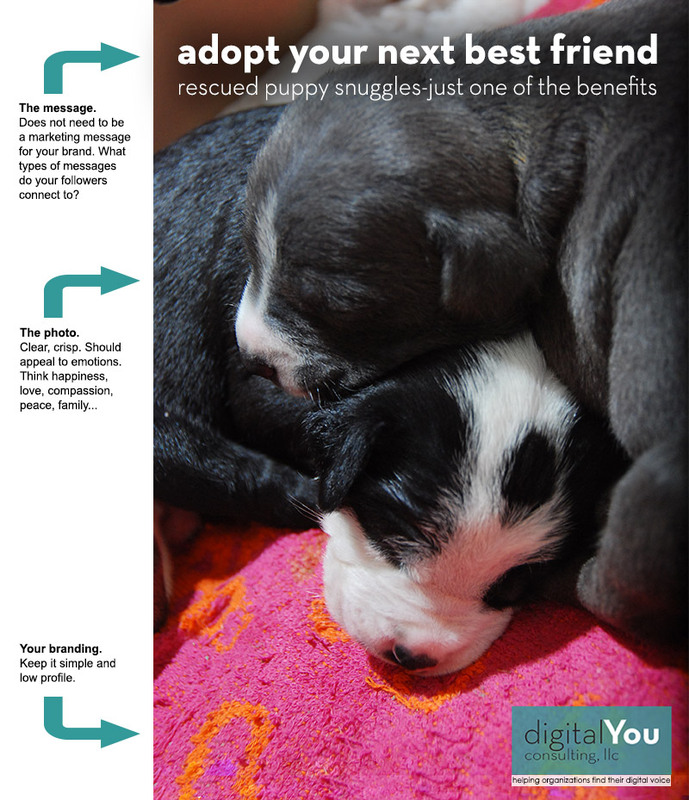 When I worked with the Petco Foundation on their strategy, what we found when we reached out a bit was that, while our core message was about pet adoption, our most impassioned followers were our pit bull advocates. This knowledge allowed us to create campaigns that wrapped around this passion and extended our reach exponentially as those advocates shared our materials. I personally am an animal person. I can tell you that, if you give me a good animal, pit bull, or adoption meme, I almost don’t care who you are, I will share it. Throw a happy, well-adjusted pit bull into your post about cookware and I’ll send it to all my networks. No really, go for it! So, what are your networkers passionate about?